Diego Maradona was an Argentinian footballer, one of the world’s finest ever players. His greatest achievement being to lead Argentina to win the World Cup in 1986, but if there was one match that showcased his talent and his personality it had to be the quarter final game of that tournament against England. Maradona scored two goals, the first when he punched the ball over goalkeeper Peter Shilton’s head which surely was reward for the lowest form of cheating ever seen in a football match. His second, when he picked up the ball in his own half and appeared to beat every member of the England team at least twice before scoring is rated by many as the greatest goal of all time. How could one individual stoop so low yet also reach such lofty heights within one game. They say 90 minutes is a long time in football though surely not long enough for that, but Maradona scored both goals within three minutes of each other. In those three minutes a whole nation got their revenge for the Falklands and one man was made a saint. What would be the astrological signature of all this ? The only sign capable of such extremes would have to be Scorpio, carrying the horoscope column imagery of the sting in the Scorpion’s tale and the capacity to stoop to the lowest behaviour imaginable but also to reinvent the self so deeply and profoundly that everything is swept away with a phoenix like rise from the ashes to the peaks. Diego Maradona is a double Scorpio with the Sun and Ascendant in the sign. Even so, that doesn’t fully explain it. The only astrological symbol that can cover deception as well as transcendence is Neptune, the ruler of the invisible realm. Visions and illusions belong to Neptune, both sainthood and the magician’s sleight of hand. 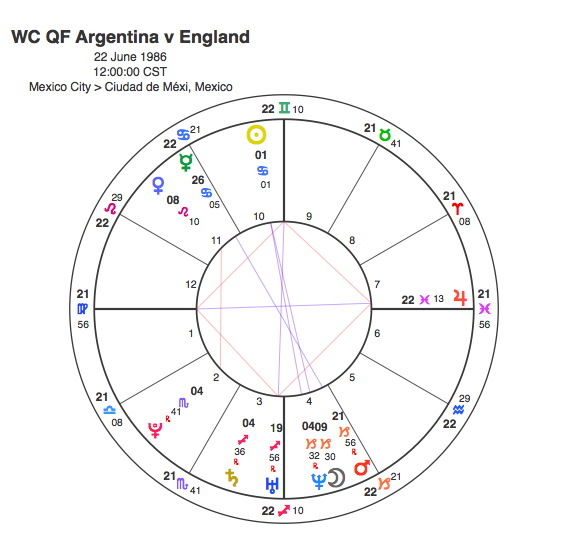 Maradona has the Sun conjunct Neptune, but whether saint or sinner probably depends on which team you support. Another interesting point is Neptune has rulership over drugs and Maradona was banned whilst playing club football for Napoli and also sent home during the 1994 World Cup after testing positive. 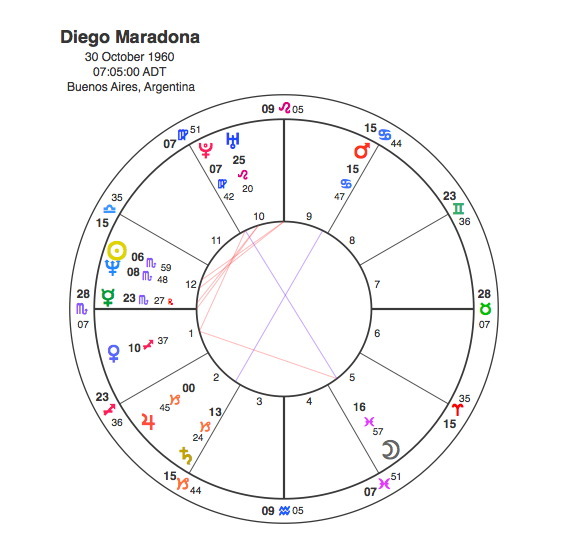 The ruler of Scorpio is Pluto and Neptune rules Pisces so just to reinforce the symbolism, Diego Maradona also has a powerful opposition between the Moon in Pisces and Pluto. This opposition focuses onto a Tsquare to Venus in Sagittarius in the first house. A Tsquare to Venus creates a powerfully magnetic and attractive personality, Princess Diana also had a Tsquare to Venus but there was probably a time around the mid 80s when Maradona’s picture was in the papers even more often than her’s. Those three minutes were pivotal in his iconic life, so important that we should study the chart of the match. This chart reinforces the Neptune imagery. The Sun is at the top of the chart but it is also at 1 degree of Cancer, the longest day of the year. The Sun is in strong opposition to the Moon / Neptune conjunction in early Capricorn ( the darkest time of the year ) at the bottom of the chart. The whole thing shows that this game would contain both the highest and the lowest principles imaginable. As if to emphasise this, the first goal occurred 51 minutes into the match at which time the Moon and Neptune had moved to the very base of the chart. Argentina went on to win the World Cup and Diego Maradona appeared to win it for them almost single handed. Never before or since has one player had such an impact on a major tournament. Pluto, of course, was conjunct his Sun from December 1985 to September 1987. Maradona made his full international debut at age 16, in 1977. The following year he played in the World Youth Championship for Argentina, and was the star of the tournament, shining in their 3–1 final win over the Soviet Union. He is the only player to win the Golden Ball at both the World Cup ( in 1986 ) and the Under-20 World Cup in 1979. Pluto was square Maradona’s Mars from 1977 to 79. Diego’s international career lasted 16 years but ended when he was sent home from the 1994 World Cup after failing a drugs test. Pluto was conjunct his Ascendant in 1994 – 5. The most important points in any sportsman’s charts are the Sun, Mars and Ascendant in that order. Pluto has only made one transit to each in his life so far but they marked the peak, the beginning and the end of his international career. When asked if he’d handled the ball for the first goal against England, he replied it was ” A little with the head of Maradona, and a little with the hand of God”. Of course he meant the hand of Pluto.